Novellas aren't really my thing. Not that I've got anything against them, it's just that the bulk of my reading is the standard 300 something page novel, sometimes venturing into those 1,000 page fantasy tomes (hello Malazan series). Novellas have to work hard; they've got a short amount of time to build a world, flesh out characters, and tell a story. 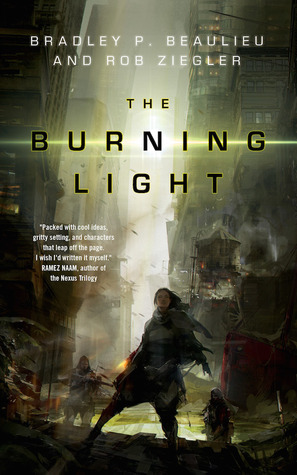 But the synopsis of The Burning Light sounded like something I'd enjoy, and I'm really glad I went outside my comfort zone on it. The Burning Light delivers. Colonel Chu is on a mission. The Light is spreading like an epidemic. It's destroyed her life and it's burning out people who come in contact with it. She's going to snuff it out. Zola used to be a pilot for a corporate collective, but the Light changed all that. She has a special connection to the Light, but Chu is closing in on her. Being a novella, The Burning Light has to be efficient and it absolutely is. It moves fast to establish its setting and characters. It's aided by a lot of cyberpunk shorthand. Gov soldiers are black-clad and sleek, junkies are strapped for cash and burnt out, and the world is flooded and filthy. It's not that it's cliche or stereotype, but taking some smart shortcuts to get to the meat of what the story is about, which is Chu and Zola and the Light. It didn't take more than 10 pages for me "get it". Then it gets to the characters, and their motivations. This is where no shortcut will really suffice, and Beaulieu and Ziegler handle it well. Both of the main characters have complex histories, supporting characters exist with enough to have voices of their own, and The Light is more than a MacGuffin. I don't really have much negative to say. It does everything well and I didn't get tired of it. With only 100 pages, it would be easy to this go wrong, either leaving too little story or crafting characters out of cardboard. It's clear that The Burning Light was written with skilled hands. It packs a lot into a novella and left me wanting more.